To many Van Gogh is famous for his five sunflowers paintings, each a masterpiece in its own right. Few hear about his water colour ones. He admitted they weren’t great. In a short story it’s all about getting its message across; the details a writer has chosen can be likened to the palette of colours for the lighting in painting. Table Manners and Other Stories is eighteen exciting tales offered by Susmita Bhattacharya, the author of the highly-acclaimed The Normal State of Mind. She gives dapple grey depictions to her protagonists; her narratives flow in such a way that each piece entices different sensations in its denouement. Her observations on the intricacies of customs of different cultures are endearing. Time and place are like the crisscrossing lines over the troposphere on a clear day. Some of the stories in the collection have appeared in various publications. ‘The Taste of Onion on His Tongue’, captures a blade of loneliness glinting in the moonlight. Bhattacharya marvels at discussing why a widow whose windows face a couple across the street is doing what she’s done; her succinct telling is without a hint of judgment. In ‘Good Morning Miss Molly’, the lighter mood displayed in the absence of tears conceals little of the pains in the aftermath of a loss. Her experiment with various lightings in her blend of contrast is stupendous. In ‘Comfort Food’, the scene of a business dinner in a high-end restaurant attests her main character’s relationship with food; the awareness of what’s coming to Li Xian is unexpected, wrapped in her physical presence in an ambience she feels connected in the least. By the same token, ‘The Summer of Learning’, which depicts a Welsh girl’s lifetime’ holiday in an Indian town explores a deep-seated memory that leaves an indelible mark from the onset: ‘when Lali stole Dad’s money, she stole my childhood‘. In a similar nuance, ‘That Face’, Like a Harvest Moon recollects an uncommunicated matter, a no-go subject in Indian society, highlighting those who suffer in silence and carry on nonetheless. She has little intention to distance herself from the current political atmosphere. ‘Letters Home’, bites on 7/7 bombings to whom which is perceived to share the same identity with the perpetrators. ‘Marked’, brings forward the taboo of an interfaith marriage with Brexit gloom as the icing of the cake. Likewise, ‘A Holiday To Remember’, seems like a People’s Friend’s story at first with a twist. Yet halfway through a freezing caravan holiday for an Indian couple and their baby the cracks in the couple’s viewpoints are opening and hoovering in the pleasant air of their fresh start in Britain. Van Gogh regards his water colour piece as a study; his learning as to which light works. For many painters understand the cost of a slightest doubt in stippling marks using water colour. Bhattacharya’s way of penning her thoughts is bold but not overpowering and her plots work well. Yet, just as what the Dutch man learnt, a change in a shade of colour could alter the feeling of a piece. Some jarring facts wouldn’t alter the whole picture but do leave a slight snag. For instance, it’s arguable whether a man who lives by his ready-meal supplies would recognise the difference in smell between lemon grass and garlic in Chinese cooking. Is a Bengali man who comes to Cardiff to work in a restaurant able to write in fluent English about his new life to his pregnant wife? Would a daughter’s arrival really be a cause of celebration in Pakistani culture? Besides, it seems there is more to reveal in some stories that would suit a longer story or even a novella. Van Gogh’s sunflowers wouldn’t have materialised without the hundred-and-fifty studies he did. Table Manners and Other Stories perhaps can be seen in this way too. 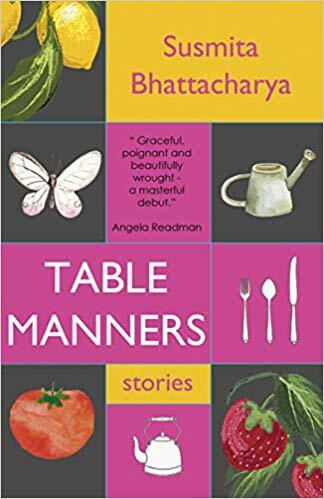 Bhattacharya’s contemporary issues are very relevant; an outlet for more conversations on issues that have been simmering in the midst of life.